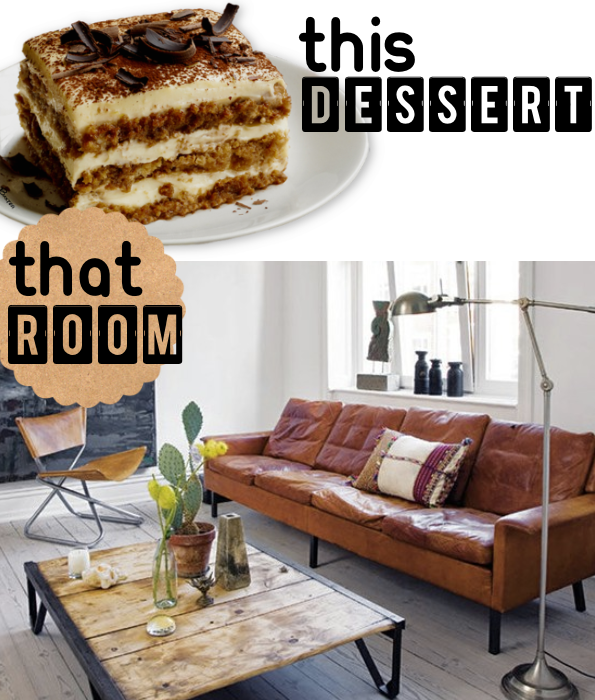 The layered creams and soft chocolatey browns of a delicious Italian tiramisu lend themselves to salvaged wood, mismatched chocolate tones, and Italian leather. 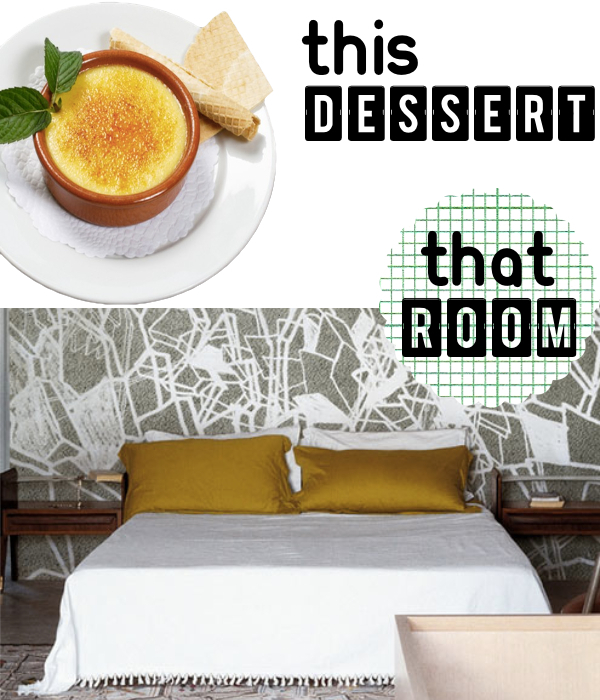 Room via Do You Fancy This? The Magnolia Bakery cupcakes, as made famous by Carrie Bradshaw, are buttery old-fashioned treats. The delicate pistachio cupcakes are whipped up with pistachio meringue buttercream and topped with the nut itself! These special treats also have hand designed cupcake wrappers. The room is by Robert Passal presented at the 2012 Hampton Showhouse. 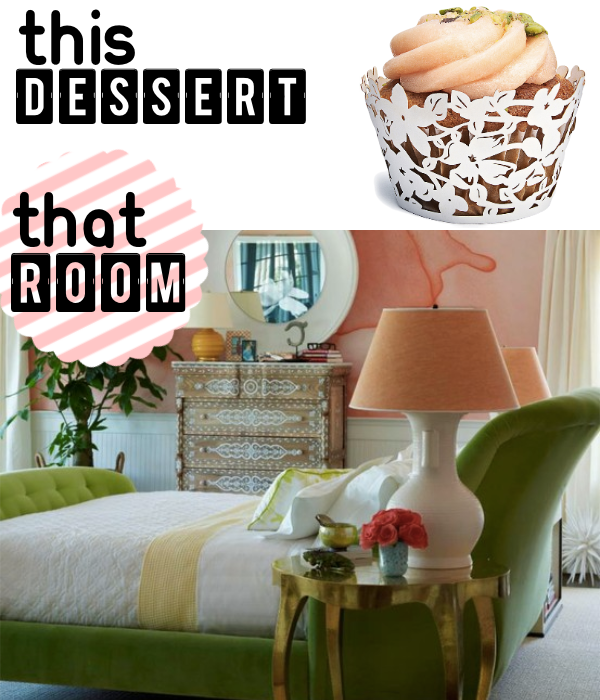 The deep greens, playful feminine pinks, and delicate vanilla-colored detailing match the delicious dessert perfectly. The statement wallpaper is a custom design withBlack Crow Studios. Image via Tilton Fenwick. A classic creme brûlée (also known as burnt cream) revolves around custard and hardened caramel colors. A mint leaf adds a bit of color to the earth toned palette. A room that captures the crisp geometric patterns of a doily, as well as the dark tones of an earthenware ramekin is both calming and reminiscent of burnt sugar via Design Milk. A fluffy whipped marshmallow cloud is feminine and delicate in this lovely Baked Alaska photograph (and recipe) by Sarah Phillips via baking911.com. 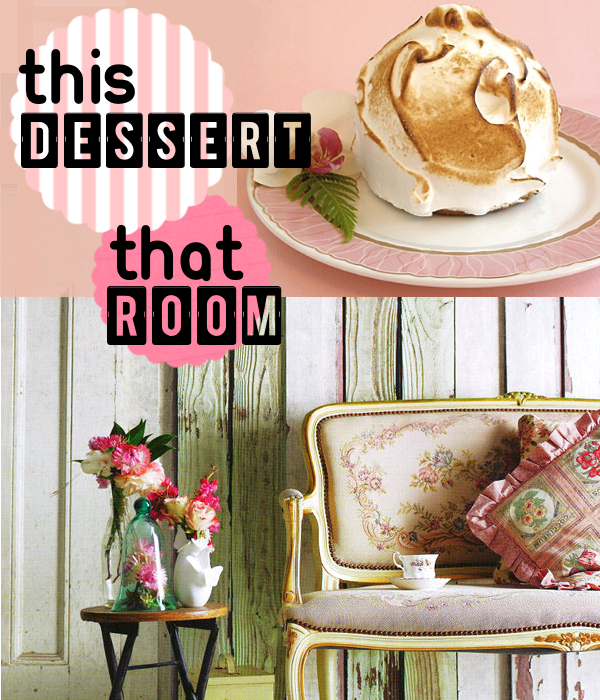 Dainty gold leaf plates with Victorian touches are reflected in this rustic yet opulent shabby chic haven. Photographed by anson smart, styled by lara hutton for Country Ctyle Australia as scanned by Dust Jacket Attic. Inspired by the tempting visions of French pastry shop windows yet with the patriotic colors of the American or French flag, the fruit tart (tartes aux fruits) is a perfect summer treat – recipe of the vegan tarts and photos by Green Sage. Blueberries, strawberries, peaches, cherries and mangoes in the desserts translate into blues, reds, oranges and peaches in a bright, high contrast bedroom created by Interior designer Janet Gridley. The whimsy of mismatched historic wallpaper, granny squared quilts, nautical hints, red lacquered side tables and rope fixtures are bold and cozy. 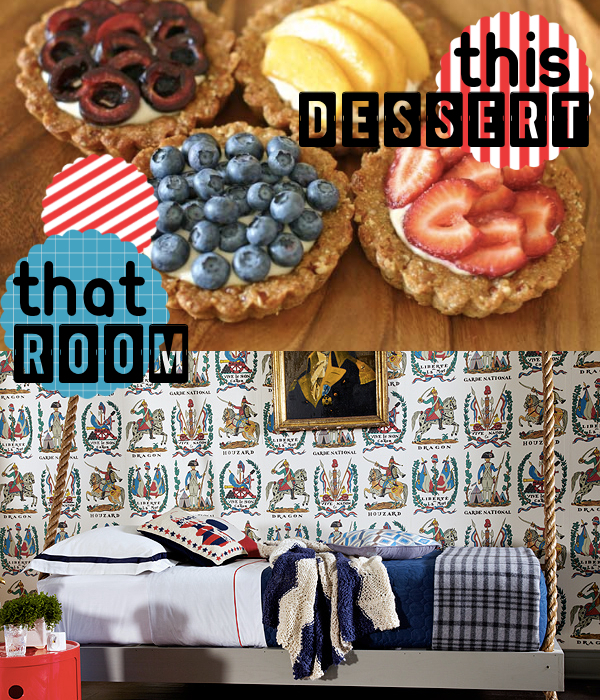 Images and complete room by D Magazine, here. What dessert would YOU choose? Bon Appétit!